How many people do you know that only fly on one airline, even if they hate it beyond reason? They put up with poor service or inconvenient flight times all because they’ve racked up status or miles with the company. They can’t switch or they start over from square one with a new airline that might only be marginally better; the switching costs are too high. As we bring more data into all aspects of our shopping lives, consumers may suddenly face the same conundrum in restaurants or stores. As data collection and predictions improve, stores are better able to anticipate the value of a customer and reward them accordingly. This leads me to wonder two things, how does this change customer service? And will it drive consumers to greater loyalty by making the cost of switching providers higher? 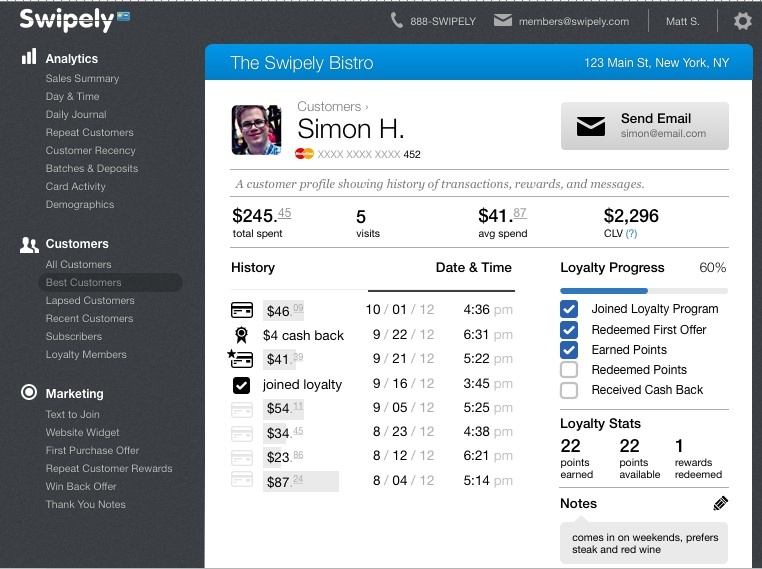 I spoke yesterday with a company called Swipely that provides a payment system to small businesses. The company is now managing more than $500 million in annual sales — a number that has grown 100 percent the last three months in part because its customers get a side order of data with the payment processing. One of the metrics Swipely offers is an estimated customer lifetime value (based on demographic data and the amount the customer has already spent). Seeing this gave me a bit of a chill, in part because it took the concept of customer service and turned it from a basic expectation to a cold calculation based on your potential worth as a customer. That’s not to say that clerks or managers at restaurants will suddenly turn into jerks for customers who don’t shop there often, or will play it cool with new customers until the vendor determines how much that individual might be worth to the business. Heck, in many ways that already happens: shopkeepers often assess your likely purchasing habits by your demeanor, dress and other physical attributes. But putting a number on your worth as a customer and cloaking it as data turns it from a hunch into something that feels rational and scientific, even if the algorithm behind that metric is unproven. And believing they are behaving rationally can drive businesses to make really inhumane decisions about humans. In an ideal world this data would be used to reward loyal shoppers (perhaps in the same way the Ritz Carlton rewards its loyal customers already), but what happens when this experience trickles down from a high-end hotel to a local toy store? It’s one thing to eat every week at a nearby Mexican restaurant and have the manager know your name and set aside a table for you. It’s another when based on a few visits to an establishment, you’re lumped into a certain class of customer based on predicted spend than gives you substantial benefits. Can vendors offer enough perks to those “whales” that they might ignore a lapse in service to keep their free queso coming? Does this added layer of data start to boost customer retention to the point where it’s harder for another restaurant to win business? This may seem almost silly, but in the cell phone industry things like early termination fees, contracts and (formerly) the inability to port a telephone number created such high switching costs that there are concerns about those practices making the market less competitive. I would like to think that better data in loyalty programs wouldn’t distort the market for local goods and services, but I am curious if it will. Human nature is such that a free bowl of queso and someone knowing your name can overcome mediocre enchiladas and the occasional service lapse. And if you’re opening a taqueria down the street getting those customers in the door might prove to be more expensive and have little to do with your fabulous tomatillo sauce. For starters, I wouldn’t recommend any business owner who wants to grow sales and repeat business look at airlines for inspiration. Airlines are almost universally bad, the reason they get customers coming back has less to do with loyalty programs than with low fares, routes and airport dominance of a particular carrier. Local merchants want to grow their business. You can’t improve what you can’t measure. Allowing small business owners to measure how changes in their service and products impacts growth in customer retention, spending per visit and overall sales is good business. Much of the first 10 years of e-commerce was about taking what worked offline in mail-order and telephone-order and putting them to work in an e-commerce model. E-commerce has now lapped traditional retail in its sophistication of understanding customers and using that understanding to grow sales. Much of the next 10 years will be about taking some of the best ideas from e-commerce and extending them to the 95% of retail sales that today occur offline, where local merchants have largely been left behind from recent advances in commerce technology. This will improve the customer experience for consumers and it will help merchants grow more efficiently, as merchants can measure investments by the actual sales results in the store rather than esoteric abstractions like “lift”, fan count or follower count. When you say, “Human nature is such that a free bowl of queso and someone knowing your name can overcome mediocre enchiladas and the occasional service lapse,” I am not sure I follow the point. Recognizing an important customer and thanking her by name is the essence of high quality service in a hospitality business. Take a look at Four Seasons Hotels for example. And if a service lapse does occur, another example of a good business practice is to apologize genuinely to the customer and, if appropriate, extend a credit towards a future visit so you may earn the opportunity to win back their trust and loyalty. Swipely shows merchants an LTV estimate of every credit card customer, using a standard algorithm that is both scientific and proven, but the important objective of this metric, just one of many we share with small business owners, is to help merchants understand the importance of customer retention and visit frequency, which have a far greater impact on LTV than other factors. We work with hundreds of local merchants and invariably they use this data to improve their quality of customer service, not to hamper it. Making more customers feel like Norm does when he walks into Cheers is a good thing in my book. Thanks for listening. Stacey, I’m sorry, but where in this article are the actual high switching costs? You start out with an airline example, but that only matters to people who have status or are trying to accumulate a free trip. But then you start talking about data and here there are no switching costs, nor do you tie it back to the initial premise of airline travel. BTW, Most airlines don’t do a semi-competent job of remembering preferences or sending personalized offers (though they talk about it incessantly). So can you tell me where I lost the thread here? The idea is people stick with airlines because the high switching costs associated with losing their miles and status. I wonder if the same thing will happen as data analytics at the local business level help businesses create loyalty programs that are more finely tuned to high-value customers. The value of the perks associated with the loyalty programs might raise the costs to try out or visit alternative vendors. Thus a local merchant might “trap” customers with perks much like airlines can.